Rural school districts struggle to attract, retain, and support highly qualified mathematics teachers. A series of four online professional development courses in the form of integrated mathematics content and pedagogy courses was designed to meet the professional development needs of rural middle school mathematics teachers. Changes in teachers’ mathematics content knowledge and their pedagogical content knowledge over the duration of the courses are documented. Results suggested that while teachers’ mathematics content knowledge did not change significantly, pedagogical content knowledge did increase. Additionally, the design of the courses fostered communities of practice among the teachers, and can be used as a model for other distance learning courses. Cady, J. & Rearden, K. (2009). Delivering Online Professional Development in Mathematics to Rural Educators. 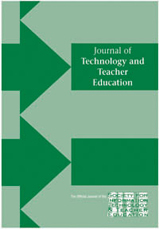 Journal of Technology and Teacher Education, 17 (3), 281-298. Waynesville, NC USA: Society for Information Technology & Teacher Education. Retrieved April 25, 2019 from https://www.learntechlib.org/primary/p/28295/.